Didier Cuche is brimming with energy, and is infusing a new burst of vitality into Corum’s timekeeping functions. In tribute to its new ambassador, the watch brand from the Neuchâtel mountains presents a Limited Edition watch: the Admiral’s Cup 44 Chrono Centro Didier Cuche. The precision of Corum timepieces echoes that prevailing on the ski slopes, where performances are timed to the nearest hundredth of a second. It also reflects technical mastery: the kind that enables the brand’s watchmakers to create masterpieces of mechanical miniaturization recalls that of Didier Cuche on the most spectacular downhill runs. Other common denominators include concentration, meticulous attention to detail, and regularity. It was thus entirely natural that the partnership between the skiing legend and Corum should be materialized through the creation of a dedicated watch. The sporting nature of the Didier Cuche model is embodied in the velvety matt glow of its 44 mm case in vulcanized rubber. 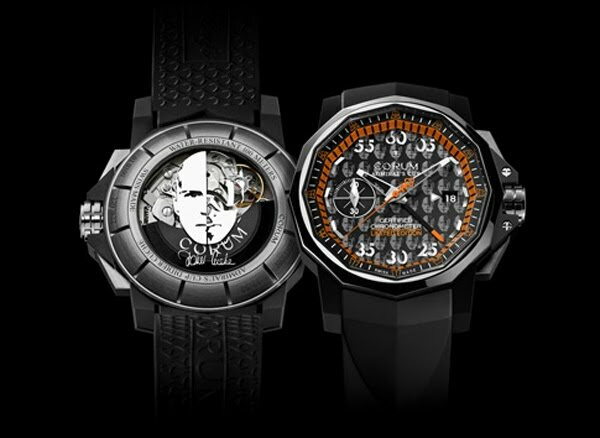 Its extreme black interpretation of Corum’s signature twelve-sided design creates a striking contrast with the orange accents revealing the sheer vitality of this model: the rim of the nautical pennants on the fitted flange, the chronograph seconds hand, the Limited Edition logo, as well as the minute circle surrounding a dial featuring a truly unique décor. The center is adorned with a tapestry motif depicting the sportsman, whose face – part ski champion, part private citizen – is transferred on the dial using tone-on-tone, matt and shiny effects. Two versions of the Admiral’s Cup 44 Chrono Centro will be issued: one with a black dial and the other with an anthracite variation. This limited edition is powered by the mechanical self-winding CO960 movement that is chronometer-certified by the COSC. It is equipped with the ultimate sports complication, the chronograph, interpreted in the distinctive Chrono Centro mode. The chronograph minutes hand, which traditionally appears on a small dedicated counter, is in this case mounted on the same axis as the hours and minutes hands. In addition to giving the chronograph and original and extremely restrained appearance, it also considerable enhances readability, especially since the chronograph minutes hand is tipped with orange Superluminova. The case is water-resistant to 100 meters and secured by an grey sapphire exhibition back that creates a surprise effect by adopting the same distinctive Didier logo appearing on the tapestry-work dial center, in this instance metallized onto the crystal to create a mirror-like effect. The Admiral’s Cup 44 Chrono Centro Didier Cuche is fitted with a black vulcanized rubber strap and a triple folding clasp. This resolutely sporty watch will be issued in a strictly limited 100-piece edition.